French Tomatoes recipe by Nazia Nazar at DesiRecipes.com. 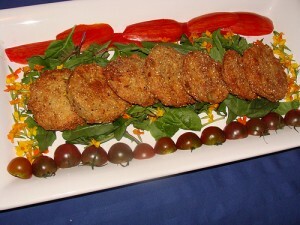 This is a recipe for french fried tomatoes, made wth salt and sugar, egg, milk and bread crumbs and deep fried. Wash the tomatoes and cut them in 1-inch slices. Do not peel. Dust with salt , pepper and sugar. Whisk beaten egg with milk. Dip tomato slices in the egg mixture, then roll the in the crumbs. Place in a frying basket and fry in deep oil hot enough to brown a cube of white bread in 55 seconds (about 370°).